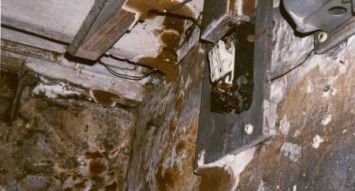 Damp is a common cause of concern in historic buildings. Identifying the source of the damp and allowing the building to breath are two key objectives, as non porous materials such cement or paint can create a damp substrate or channel damp into damaging locations by capillary action. Conservation specialists will understand how such buildings work and avoid damaging solutions. Condensation is also an increasing problem, due to modern living humidity increases and ventilation decreases.